All donations made that night help the Dalhart center continue their efforts to educate the Dalhart community and help build a better future for the children of Dalhart! Newlife Church - 402 Tanglewood Rd. This auction will feature... antiques, collectibles, sporting goods, furniture, appliances, household items and much more! Community Cookout on Thursday, March 7th from 11am-1pm. KXIT Radio will be live on location and WE will be serving up Hamburgers, Hot Dogs and all the trimmings! We will be doing FREE quotes all day plus drawings for some GREAT Giveaways you don’t want to miss out on!! The start of the 2019 Sun Adventure Six Pack Series kicks off March 16th & 17th at Rita Blanca in Dalhart, TX! Join us Saturday for the 5K trail Run and Sunday for the Mountain Bike race with 8,16,24 mile courses. Fun for all ages and riders, Beginner to expert come out and race! We will be hosting a benefit for Alexi & Cameron Harrison at the the Lodge. We will have silent auction items available to bid on and live auction items as well. The price is $10 per person or $15 per couple. Please come and help support this young couple in the time of need. Adult beverages are available for purchase, as well as soft drinks, water, tea and coffee. Everyone is welcome! March Professional Ladies Luncheon. Heather Weidner, Executive Director with Safe Place will present on serving victims of domestic violence and sexual assault. Please rsvp by March 15th so we can be sure to have enough food! This is a FREE lunch! Register for the Dust Bowl Marathon, have a bite to eat and enjoy walking through the XIT Museum. Our lab team will be at Bowers Prescription Shop on March 21st performing lab tests, free of charge! Attendees over the age of 18 can receive a Chem 14 and, if they are fasting, a Hemoglobin A1C. If they are not fasting, they will receive a coupon to come in and have the test on their schedule. We will also have our new physicians and a demonstration of our telecardiology equipment. 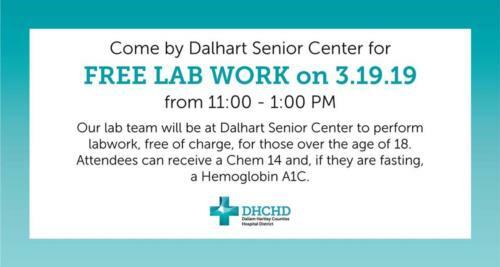 Our lab team will be at United Pharmacy on March 21st performing lab tests, free of charge! Attendees over the age of 18 can receive a Chem 14 and, if they are fasting, a Hemoglobin A1C. If they are not fasting, they will receive a coupon to come in and have the test on their schedule. 5k Color Run/walk $15 for run entry OR $5 a bag per color if interested in throwing color! Harrington Breast Center will be coming to Dalhart for Breast Cancer Screening. Save the Date! You are invited to join us as we celebrate Scouting and the impact it has in Dalhart! Join Meals on Wheels and help them celenrate their 30th Birthday! Join Green Country March 29 to learn how to boost productivity and efficiency with the Gen 4 display. We’ll also take you through new improvements to the John Deere Operations Center. More more information please goto our Dalhart Elks facebook page, to the events, click on the discussion.